Google Drive and its attendant apps offer a wealth of tools to help you be more productive. Try these five for the biggest boost. Like it or not, there are times when you have to work without an Internet connection. 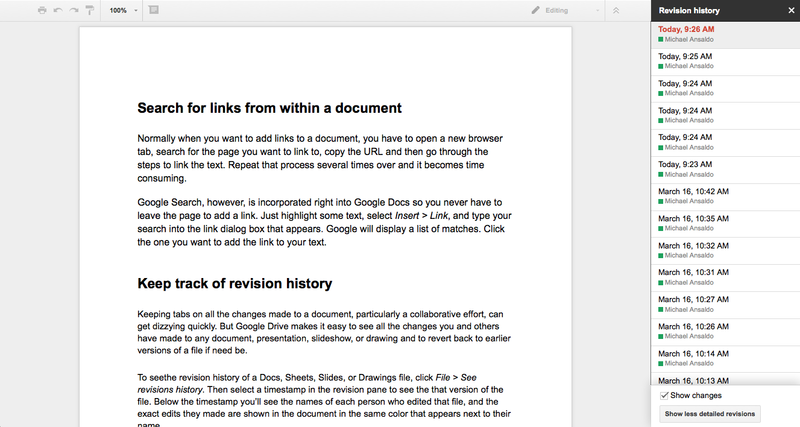 Fortunately, Google Drive has an “offline” mode that lets you create, view, or edit documents in these situations. Using Google Chrome, you can set Google Drive's apps to work offline. You’ll need the Chrome browser to activate the offline feature. Go to your Google Drive account, click the gear icon in the upper right corner and select Settings. On the General tab, make sure the box labeled “Sync Google Doc, Sheets, Slides, & Drawings files to this computer so that you can edit offline” is checked. You’ll need to work in Google Drive in Chrome when you don’t have a connection, but all your changes will sync once you’re back online. Normally when you want to add links to a document, you have to go through the tedious process of opening a new browser tab, searching for the page you want to link to, copying the URL and going through the steps to link the text. Google Search, however, is incorporated right into Google Docs so you never have to leave the page to add a link. Just highlight some text, select Insert > Link, and type your search into the link dialog box that appears. Google will display a list of matches. Click the one you want to add the link to your text. Keeping tabs on all the changes made to a document, particularly a collaborative effort, can get dizzying quickly. But Google Drive makes it easy to see all the changes you and others have made to any document, presentation, slideshow, or drawing. You can even revert to earlier versions of a file if need be. Revision history helps you untangle a document's changes and revert to earlier versions. To see the revision history of a Docs, Sheets, Slides, or Drawings file, click File > See revisions history. Then select a timestamp in the revision pane to see that version of the file. Below the timestamp you’ll see the names of each person who edited that file. The exact edits they made are shown in the document in the same color that appears next to their name. By default, revisions are grouped into general time frames, but you can view more granular details by clicking Show more detailed revisions at the bottom of the revisions pane. To revert to the version you’re currently viewing, click Restore this revision. 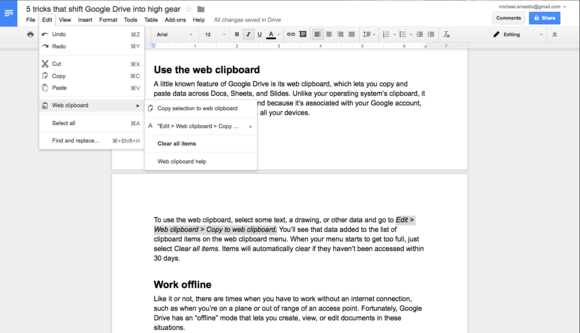 A little known feature of Google Drive is its web clipboard, which lets you copy and paste data across Docs, Sheets, and Slides. Unlike your operating system’s clipboard, it can hold multiple items at once, and because it’s associated with your Google account, its contents are accessible across all your devices. 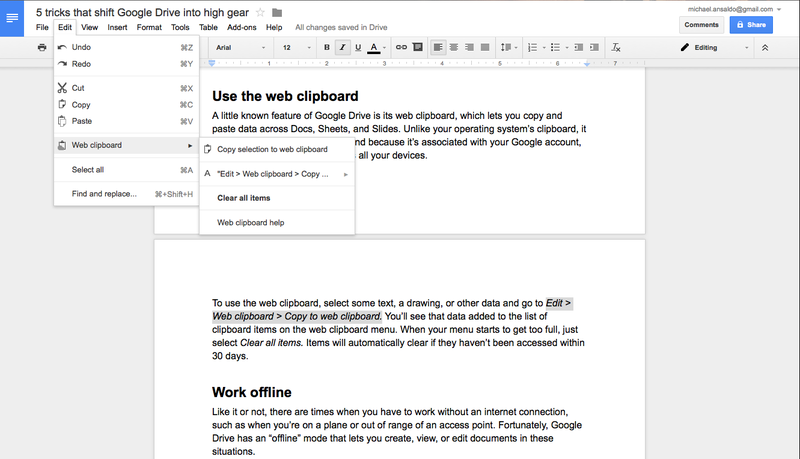 Google Drive's web clipboard holds multiple snippets of data and makes them available across all your devices. To use the web clipboard, select some text, a drawing, or other data and go to Edit > Web clipboard > Copy to web clipboard. You’ll see that data added to the list of items on the web clipboard menu. When your menu starts to get too full, just select Clear all items. Items will automatically clear if they haven’t been accessed within 30 days. 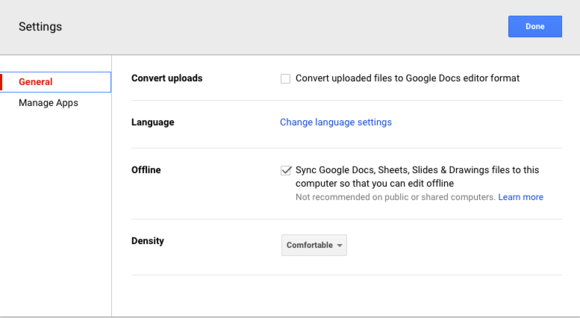 Google Drive’s sharing feature is great when you want to make a document available to a handful of people, but what if you want a wider viewing audience? For that, use Drive’s Publish feature. To publish a document, spreadsheet, presentation, or drawing, open the file and click File > Publish to the Web. Certain file types have some customization options available on the menu: you can choose to publish an entire spreadsheet or just individual sheets, set the speed at which a presentation’s slides advance, and choose the image size of a drawing. When you’re ready, click Publish, then copy the link that appears and send it to everyone you want to view to file. If you want the published file to update automatically when you make changes to the original, go to the File menu and select Publish to the Web > Published content & settings. Check the box labeled “Automatically republish when changes are made.” To remove the published file, select Stop publishing. 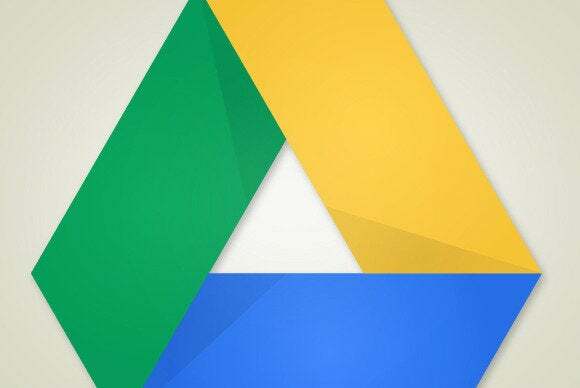 This story, "Try these 5 undiscovered Google Drive tricks" was originally published by PCWorld.